There’s a bit of a revolution happening in Newstead and Tenneriffe. After years of promised development, failed development and stalled development, there are new apartments and businesses popping up all over the place. One very welcome development is The Gasworks. Welcome because after working at the wrong end of town for two years, there is now a newsagent, supermarket and chemist within walking distance of my building. If the thrill of being able to buy a lotto ticket, rice crackers or cheap nail polish is not enough, there are also several restaurants in the shopping precinct, known as Gasworks Plaza. As a nearly local, I was invited* to try out Peng You China Kitchen & Bar and report breathlessly back to my colleagues and readers. It was hot as hades when I visited with my partner in crime Jenny, on my last working day of the year. With the combination of outdoor dining and holiday atmosphere it was a little too warm for wine so why not have a icy but lethal lunch time cocktail instead? The list had lots of fabulous names such as China Sky House and Enter The Dragon but I opted for a Lemongrass Mojito and Jenny, a Hai Nan Iced Tea. The presentation of my Mojito was outstanding though I would have like a little more bruised lemongrass flavour in the cocktail itself. From this pair, the Iced Tea with sake, rice wine and green tea liqueur was the favourite. The Peng You menu takes you on a tour of Hong Kong and Cantonese cooking styles with a few detours thrown in. 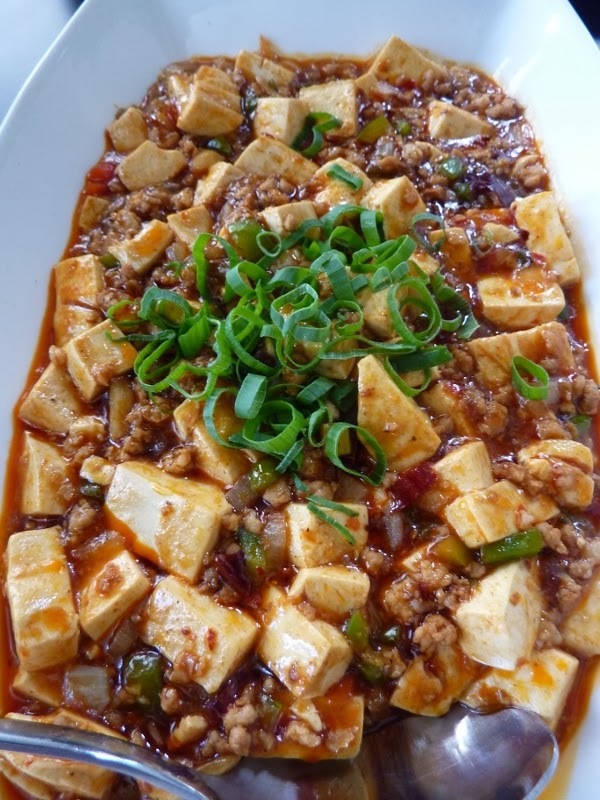 Co-owner Joyce Chiu told me that they had to include Sichuan Mapo Tofu as it was the most popular and requested dish at her other restaurant, Obsession Chinese at Southbank. We went with some small bites to nibble on whilst catching up on the last few months of gossip. Griddle Cooked Gyozas steered us towards Japan with a mix of flavours and were good value at four for $6 though I would have liked them to have had more colour from the griddle pan. The Duck Sang Chow Bau ($14.50) was flavoursome and nutty. 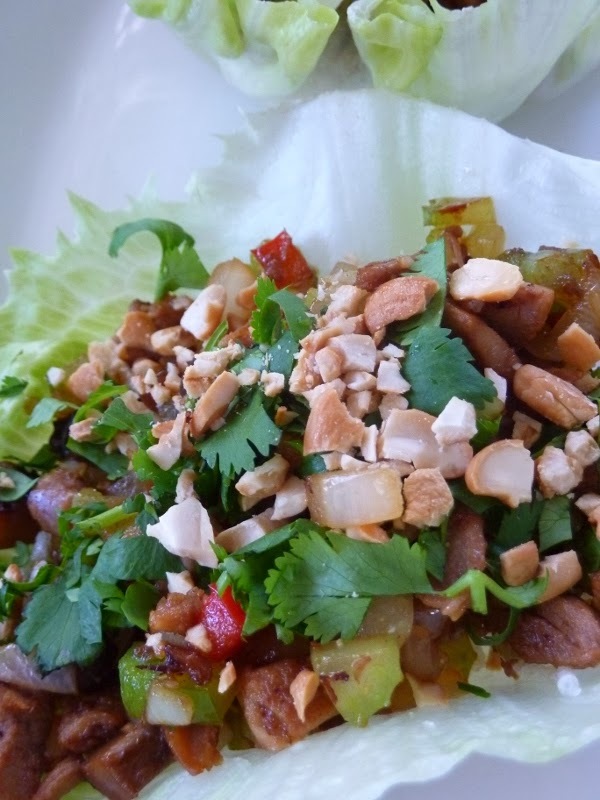 There was a generous use of the dark meat with a great inclusion of puffed rice noodles to give added crunch. The perfect starter on a hot day. After much umming and ahhing we decided upon Kung Pao Chicken ($23), Hong Kong Stir Fried Noodles w Chicken ($18.50) and of course, the Mapo Tofu ($26.50). 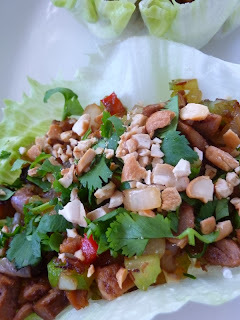 The Kung Pao Chicken was different from others we’d had before with a lighter though still spicy sauce. The Hong Kong Noodles were fairly tame. Nothing to excite but nothing to offend either. The Mapo Tofu with pork mince was unbelievably good and gave the taste buds a work out. The tofu itself was obviously very fresh and I waxed lyrical to Jenny about its silky texture between sipping down water and forking more of this spicy, saucy delight into my mouth. The tofu is a huge serve so this and one other dish would have been sufficient with the entrees but as we’d ordered three dishes, we ate the lot. Mapo Tofu – doesn’t photograph well but tastes great! 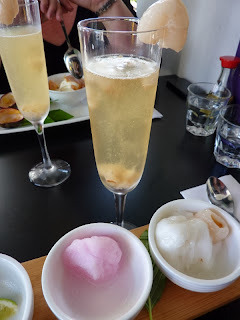 By this time I was on to the Lychee Champagne Cocktails with an even deadlier combination of Champagne and lychee liqueur. It didn’t take much to convince Jenny to join me on the slippery slope. Refreshing sorbets (including a decidedly non Asian rose petal flavour) and the biggest deep fried ice cream ball I have ever seen, followed. Peng You is simple, unpretentious food, served in pleasant surroundings. There was lots to tempt on the menu and as usual, I was sorry there were only the two of us and that we couldn’t try more dishes. All of the meals were packed with flavour and generous main ingredients – absolutely no padding out with onion or capsicum as you sometimes find when eating Chinese. Some would say that the prices are a little steep but this is not a hole in the wall in Chinatown. It’s a modern restaurant in a destination shopping and dining precinct. The service was attentive, even on a busy Christmastime afternoon and there was no rush for us to vacate our tables as you sometimes find at bustling venues. I would be happy to return to Peng You with the work gang for the obligatory ‘team building’ lunch and to chat again to Joyce, who so clearly enjoyed engaging with her customers and talking about her favourite dishes. *TIFFIN visited Peng You China Kitchen & Bar as a media guest of Lucid Media. Yes, such a chnage in such a short period of time. And so many hidden secrets in the streets that surround. It's a very funky area now days!